WorkingPoint is an Invoicing, Bill & Expense Management, Bookkeeping cloud based platform. Our goal is to help small business owners establish, manage, and grow their companies by providing the best online business management systems, content, and community. Simply stated, we are dedicated to helping you succeed. A Complete Solution — Don't juggle multiple software packages. 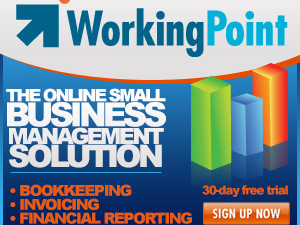 WorkingPoint integrates tools for small business accounting, online invoicing and many other small business needs. Easy To Use — We designed WorkingPoint for business owners, not accounting professionals. It is simple and straight-forward to use. High-Quality — WorkingPoint is a high-quality, time-saving system you can depend on to manage your small business accounting and finances. It lets you focus on making your business successful. Completely Secure — We use the same Internet security technologies that banks do, so your critical business data is absolutely secure – far more than it would be on your own computer. An Online System — Don't waste time struggling with software upgrades, patches and system maintenance. Online invoicing helps you get paid faster. With WorkingPoint, there's nothing to install and no upgrades to download. And since you aren't tied to a single computer, you can manage your business wherever you are – at home, at the office, or in the car.